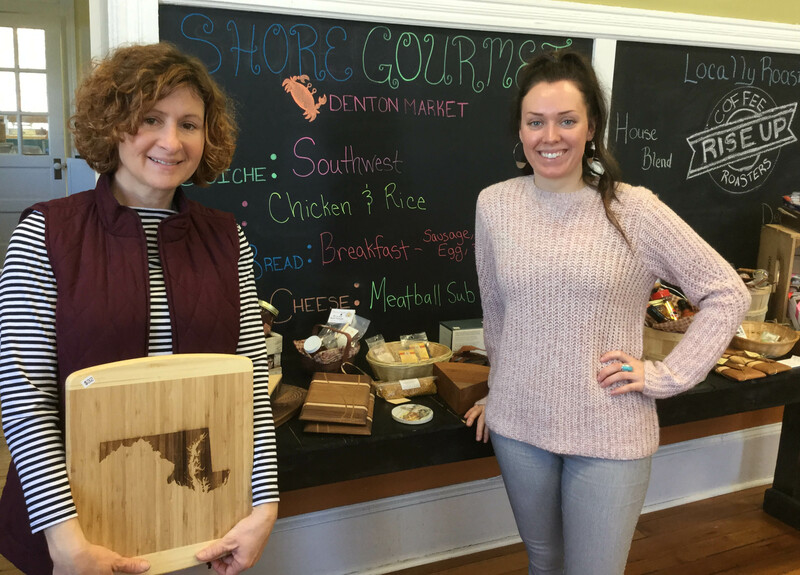 DENTON, MD – With the sheer volume of televised cooking shows and the seemingly constant sharing of recipes and posting of food on social media you’d think Americans must spend a lot of time cooking healthy meals at home. Not so much. In fact, according to the USDA Economic Research Service, Americans spend more money for food prepared away from home than they do for the ingredients of a home-cooked meal. They are also spending less time in the kitchen at the tune of only 37 minutes per day in food preparation, including clean up. Holly Foster processes hyacinth in the commercial kitchen at the Chesapeake Culinary Center, Denton, Md. The hyacinth was grown at a small farm in Talbot County. The farmer got the seeds from a University of Maryland Extension office as a pilot to see if hyacinth would grow. The harvest is now being processed for dehydration to be sold as a nutritious powder. This disconnection to food preparation and where our food comes from has health implications as well as economic ones. According to United States Department of Agriculture’s Economic Research Service in 2015, for every U.S. dollar spent by consumers on domestically produced food only 8.6 cents went to farm production while 34.4 cents went to food services such as full-service and fast food restaurants, and other places that sell food to the public for a profit. These trends have left small farms and food-based startups in jeopardy. Regionally that’s where Friends of the Grape LLC DBA the Chesapeake Culinary Center, Denton, Md., comes in. The organization recently received a $30,000 grant from the Maryland Agricultural Education and Rural Development Assistance Fund (MAERDAF) grant, which is administered by the Rural Maryland Council (RMC). The MAERDAF grant will help fund staffing and product startup support for a commercial kitchen incubator to serve Maryland’s Mid-Shore region. “We have food deserts inside of Caroline County,” says Beth Brewster, executive director of the Chesapeake Culinary Center. “It’s not only important to keep local produce on the Shore, but also to support local food processors and food-based entrepreneurs so that we can get special food products into the hands of local consumers. This grant will help us work toward these goals,” she adds. With the funding from the MAERDAF grant Brewster has hired two staff – one focusing on marketing and sales and the other one focusing on processing and operations. 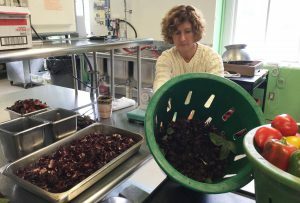 With staff in place Chesapeake Culinary Center is working on a model to provide direct assistance to farmers and other food-based entrepreneurs to guide through the often-intimidating process of getting their products to market. “We are fortunate to have two experienced staff onboard including one that was a pioneer in the cheese-making business and has first-hand knowledge of what it takes to run a value-added business,” Brewster says. “Licensing, labeling, packaging, creating a business plan and all the other components of operating a food-based business can be complicated. We want to be a one-stop shop for farmers and food-based entrepreneurs to help them create a business with a strong foundation and the ability to flourish,” she adds. Holly Foster, left, production manager and community outreach, and Kristi Conti, RDN, LDN, right, nutrition specialist and project manager, review the food products and other regionally produced items sold at Shore Gourmet Denton Market, which is operated in conjunction with the Chesapeake Culinary Center. Foster was one of the two staff hired through a Maryland Agricultural Education and Rural Development Assistance Fund (MAERDAF) grant, which is administered by the Rural Maryland Council (RMC). “Funding projects that can create sustainable business is always a plus,” says Charlotte Davis, executive director, Rural Maryland Council. “Although it should be a given that farm-fresh produce and the value-added products made from them are appreciated and in demand in rural areas, but that’s not always the case. Many products are exported out of the area for direct use and for food processing. Keeping those functions here and creating new businesses is just a win-win,” she adds. Founded in 1994, the Rural Maryland Council serves as the state’s federally designated rural development council and functions as a voice for rural Maryland, advocating for and helping rural communities and businesses across the state to flourish and to gain equity to its suburban and urban counterparts. To learn more call (410) 841-5774, email rmc.mda@maryland.gov or connect with the Rural Maryland Council at facebook.com/RuralMaryland or on Twitter @RuralMaryland.